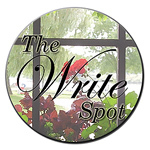 The Write Spot is back with an exciting line-up of guests for 2016. This bi-weekly author series spotlights the many and varied places where writers write. Be sure to sign up (in the sidebar) to receive stillpoint direct to your inbox each week because you won't want to miss any of these terrific authors. My guest this week is author and professional animal trainer, Rebecca K. O'Connor. Rebecca is the author of the acclaimed memoir, Lift, which won Best Book in the 2010 Outdoor Writers Association of California craft awards. She has published essays in South Dakota Review, Iron Horse Literary Review, Los Angeles Times Magazine, West, and divide. Her novel, Falcon’s Return was a Holt Medallion Finalist for best first novel and she has published numerous reference books on the natural world. 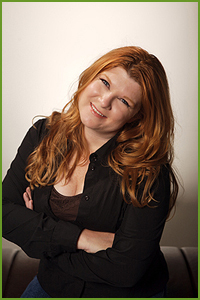 She has an MFA in Creative Writing and Writing for the Performing Arts from the University of California, Riverside. As a professional animal trainer, Rebecca has worked with a variety of exotic animals in zoos and private facilities around the United States and abroad. She has been a falconer for fifteen years and is a nationally known parrot behaviorist. Her book A Parrot for Life: Raising and Training the Perfect Parrot Companion was published in 2007 by TFH and is required reading for those adopting parrots at several rescue facilities. She is a nationally sought after lecturer at parrot clubs and parrot festivals. In all of Rebecca's work she strives to illuminate or foil the human condition through the animals that surround us. Whether it's giving a science-based lecture, writing a serious how-to book, or crafting deeply personal prose, the foundation of everything in her life is a love for animals. She hopes that her life's work will help people understand the animals (including other humans) that surround them and relish their relationships. Welcome, Rebecca. Please tell us about your Write Spot. 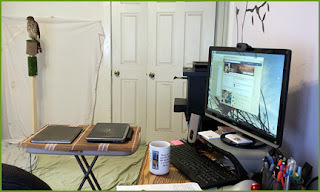 I actually have two places where I write. The first is on my front porch where I like to do my morning pages, journal, doodle, and brainstorm. I love watching the pair of red-tailed hawks that live in my neighborhood while I daydream. 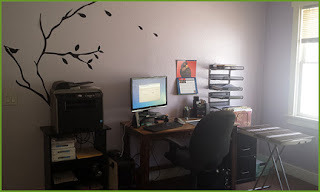 Then when things get serious, I have an office in my home. My office doubles as an animal overflow room so if I’m raising a hawk, fostering a parrot, or have any other strays, they come join me in my office as a temporary muse. And of course, there are dog beds so that my Brittannys can stay close to the action. 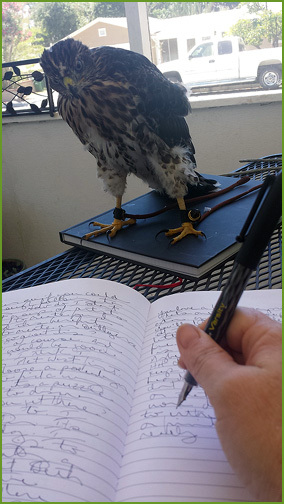 young Elsa, a Cooper's hawk. 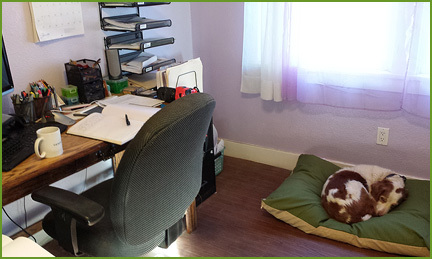 spaniel (below) hanging out in the office. You have my deepest sympathy, Rebecca. I'm sure readers will agree, Elsa was a magnificent bird. Other than your computer, laptop, or notebook, what's the one thing you couldn't be without in your Write Spot? I can’t imagine writing without an animal at my side, whether that’s a dog warming my feet, a parrot commentating in the background, or a hawk hanging out waiting for me to take a break from writing and go hunting with it. Right now I’m working on a novel that is a scifi/murder mystery/memoir. Oh, and there’s falconry in it. I’m also writing a weekly letter series, Birds, Words, and Inspiration that I hope will be a jumping off place for a nonfiction book about self-love and art. Reading your letters over Sunday breakfast has become a weekly ritual for me, Rebecca. They're always thoughtful and inspiring. 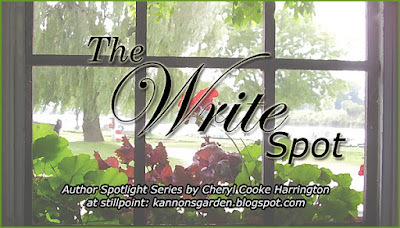 Where can readers find out more about you, your letter series, and your books? Thanks for sharing a bit of your writing life with us, Rebecca. 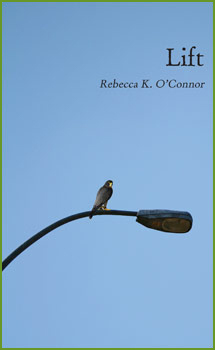 Rebecca K. O'Connor's memoir, Lift, and her other published books are available from your favorite bookseller. Thanks for such an interesting post. Rebecca must be a wonderful person to spend her life taking care of animals. Hugs to the loss of Elsa. Another interesting writer! Love hearing about new people and new books to explore (like I need any additions to my TBR list). Rebecca, I'm off to check out your website now. Cheryl, thanks for posting this. A fascinating post! My heart goes out to anyone who loves animals. So sorry about Elsa. Your love for animals comes through clearly in your writing, Rebecca. I'm so sorry that you lost your dear Elsa. Hugs to you. Hi Rebecca, Loved reading about your indoor sanctuary. So sorry to hear about Elsa. First, I am so sorry about Elsa, Rebecca. Nature can be cruel, as human life can be too. It does not make it any less sad. Your life sounds very interesting and it is obvious that animals of any kind are close to your heart. Thanks to all who've visited and commented and thank you again, Rebecca, for sharing your Write Spot and your beautiful creatures with us.